At first glance, the Juicero might seem like yet another frivolous Silicon Valley undertaking. With the admittedly eye-popping amount of capital he has raised (somewhere around $120 million, he says), though, founder Doug Evans says he has solved all of the major problems with home juicing. 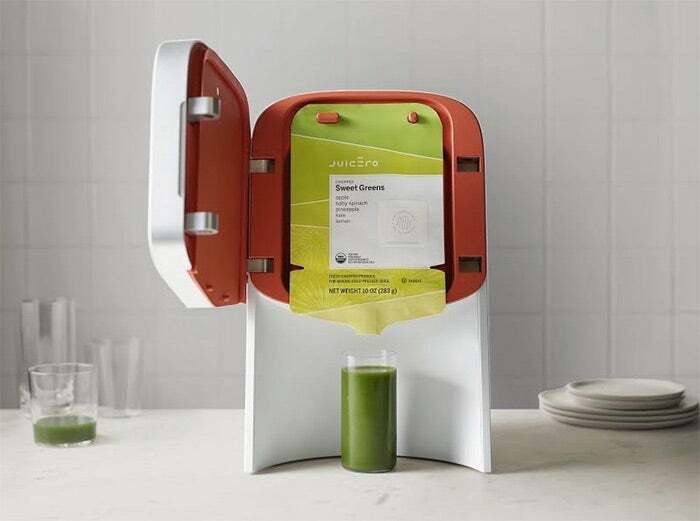 The Juicero is a new machine that connects to the Internet and takes nearly all of the work (and it can be a lot of work) out of making juice at home. It enables users to have a freshly made glass of juice essentially with the push of a button. The contraption costs an eye-popping $699 and users will shell out between $4 and $10 for each 8-oz. glass of juice they make. That’s beyond pricey, especially at the high end, but the Juicero, with its novel system for ordering ingredients and turning them into juice, is “orders of magnitude” better than anything currently on the market, Evans says. The company’s investors include a slew of big Silicon Valley names including Google Ventures and Kleiner Perkins Caufield & Byers, and food companies like Campbell Soup. One restaurant chain, Le Pain Quotidien, has already signed on to use the machines in its approximately 220 stores. “We showed it to them, and it blew their minds,” Evans says. Commercial sales might be what the company needs achieve the kind of scale that will be required to bring prices down for home users. Juicero went to market the moment it was ready (the machines are available only in California at the moment, but the company is taking orders from all over). He’s already got several dozen engineers on staff, and he’s still hiring. When Evans unveiled the product Thursday, the reaction in some quarters was a bit snarky. CNET called it a product “built to squeeze your wallet dry.” It’s certainly a luxury item, as were the washing machine and the automobile, both of which were dismissed by some when they were introduced. The Juicero won’t change the world like those products did, but it could conceivably go a long way toward changing the kitchen. A cold-press machine, it looks less like a kitchen appliance than like a Macintosh computer. It’s what the machine actually does that matters most to Evans. “I wanted to scale the unscalable,” he says. Home juicing is such an arduous chore that the market has always been naturally limited to people who really love their juice (and, perhaps, to people who buy juicers that end up in their attics after a few weeks of disuse). The Juicero is being called a “Keurig for juice,” and it really does seem to be as simple as that revolutionary single-serve coffee system. After setting up a weekly ingredients subscription through the Juicero app, users wait for their first “packs” of chopped up mixtures of organic produce to arrive. Users place a pack in the wi-fi-connected machine, press a button, and an 8-oz. glass of juice pours out. The packs -- which look sort of like IV bags -- bear QR codes, which are read by the machine to ensure the contents are fresh and to place an order for a replacement. So far, Juicero offers five varieties, like Spicy Greens, Sweet Roots and Carrot Beet, all containing different mixes of fruits and veggies. The home-juicing experience itself is friction-free, but the system providing it is far from it -- hence the expense. The organic produce, shipped from one of a dozen or so participating farms mostly in California, is specially chopped by a crew in a Los Angeles warehouse and then sorted into the packs by machine. The packs are then shipped via FedEx. Regular juicers come in several different types, the names of which promise a grisly end for bananas and celery stalks: there are, among others, masticating juicers, which chew up fruits and veggies into slush; centrifugal juicers (the most common), which slice up produce and then slam the remaining pieces against the walls of rapidly spinning drums; and cold-press juicers, which turn apples into beverages through sheer force. The latter type offers not only a relatively merciful, quick end for your kumquats, but it also yields tastier, more nutritious juice. But like all the others, it also means a lot of work for home juices, especially at clean-up time. The Keurig coffee machine has been criticized for the environmental impact of its throwaway K-Cups. That’s an issue for the Juicero, too, but Evans says that the packs are currently recyclable, and soon will be compostable. It was no small feat to create a home appliance that not only requires cleanup but also instantly yields what Evans says is the best-tasting, most nutritious product possible. For the company to succeed, however, Evans will have to squeeze costs out of the system like its signature machine squeezes juice out of a lemon.